photo-eye Gallery From the Flat Files: Platinum Recording - Prints by Kevin O'Connell, James Pitts, & Nick Brandt “The prince of all media” — is how Alfred Stieglitz once referred to the platinum printing process. Indeed, platinum printing lives up to this moniker as it is one of the oldest, most refined, and stable of all black and white procedures in photographic history. Here at photo-eye Gallery we are proud to represent a few photographers who print with this noble metal including: James Pitts, Kevin O’Connell, and Nick Brandt. “The prince of all media” — is how Alfred Stieglitz, Photo-Secessionist and founder of Camera Work, once referred to the platinum printing process. Indeed, platinum printing lives up to this moniker as it is one of the oldest, most refined, and stable of all black and white procedures in photographic history. Like most other alternative photographic processes, platinum's roots stretch back into the nineteenth century. 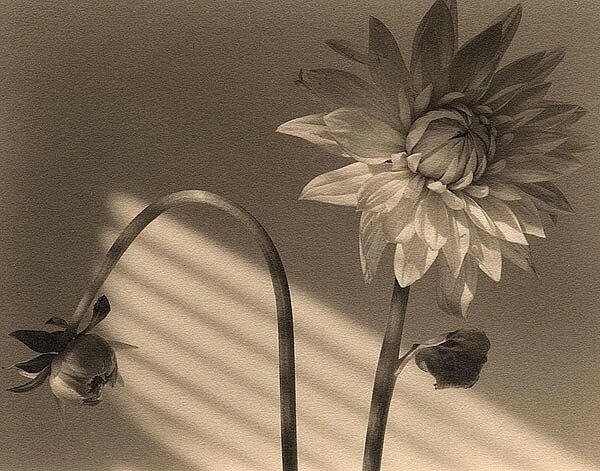 Born of noble metals, platinum prints became prominent among photographers in the late 1800s and early 1900s as they sought to elevate photography’s artistic status by creating images both elegant and handmade. Therefore, platinum images continue to carry a painterly and dramatic legacy. The platinum printing technique consists of hand-sensitizing fine cotton rag paper with a custom emulsion cocktail built specifically for each image. Once dry, negatives are laid against the paper and contact printed via a UV light source — such as the sun. The procedure is specific, peculiar, and laborious, with a single platinum print taking up to eight hours to render. Although complicated, the aesthetic and archival benefits of using platinum materials is astonishing. Compared to contemporary printing procedures, platinum prints exhibit a long and graceful tonal range, deep luscious blacks, a sense of three-dimensionality, and unique luminous quality. These traits exist in part because, unlike other prints, the emulsion is embedded in the paper instead of floating on top the way a silver gelatin or pigment print might. When properly treated, platinum prints are also some of the most permanent manmade objects ever produced, and can last thousands of years. Today, the platinum printing process enjoys a popularity among dedicated fine artists, and here at photo-eye Gallery we are proud to represent a few photographers who print with this noble metal including: James Pitts, Kevin O’Connell, and Nick Brandt. Soft, sombre, vast, and graphic, Kevin O’Connell’s Plains depicts a rarely seen side of Colorado. Bathed in a nearly golden tone, the flat western land is carved by agriculture, staccatoed with clouds, and punctuated by lone man-made constructions. Elegant and otherworldly, O’Connell’s 5x7 inch prints exude cautious serenity, mystery, and awe. See the complete portfolio. Using a large format camera, James Pitts photographs flowers in a human context. Cut from their natural environment and primped for home display, these objectified blooms speak obliquely, but poignantly, about culture’s desires to examine, arrange, and beautify. These immaculately detailed prints live in luscious warm mid-tones and long subtle gradations. See all of the images in James' Flowers portfolio on the photo-eye gallery website. For more information about James Pitts, Kevin O’Connell, and Nick Brandt — or to see any of these outstanding platinum prints in person — please contact photo-eye Gallery Director Anne Kelly: gallery@photoeye.com or by phone at 505.988.5152 x 121.